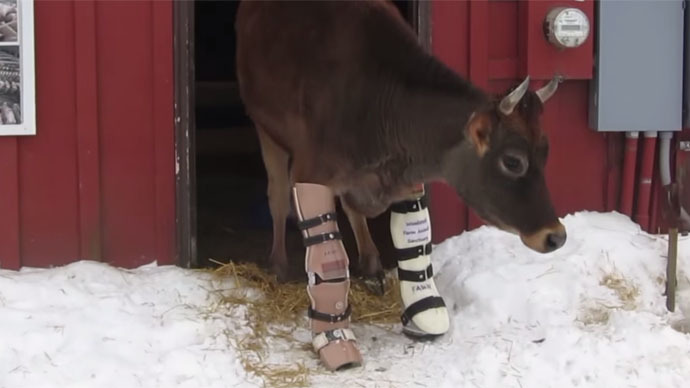 A calf named Fawn, from Woodstock NY, who injured her legs at birth, has been given leg braces, with the help of animal lovers. Fawn’s mother was chained to a milking stall, where it was impossible to lie down or turn around, so Fawn wounded her legs when she fell onto the concrete floor, the Myfoxatlanta website reported. The farm’s manager gave Fawn to a woman called Jennifer, who cared for the calf in her home. However, Fawn’s troubles continued. A vet misdiagnosed the cow and her infected, fractured knee didn’t heal properly. So Jennifer contacted Woodstock Sanctuary, where experts agreed to help the calf. Fawn has recently been given permanent braces, with animal lovers donating to support the cause.